A simple diagram illustrating the various concepts in mathematics. Let us learn about their importance in other disciplines. Analytical thinking includes judging, evaluating, comparing, and comprehending. Logical reasoning is an aspect of argumentative type that presents assertions, supports them with reasons, clarifies them through opposites and contraries, and quotes necessary counterarguments. Logic is the ability of reasoning your choices, to examine the consequence of every available action and then choose the best one. Here is an example of logical reasoning. Good analytical and logical thinking is required for good decision making skills. It is the main quality that is sought in a leader or manager. All the courses designed for business management include strong training for developing good analytical thinking and decision making skills. It is important because one decision made by a manager or a leader affects all the people who are working under him and therefore are dependent on him/her. Not only in business or at work but everybody makes some important decisions in life; analytical skills are important for everybody. These types of questions do not have particular steps to follow. They are logical questions and require rational thinking. The best way to solve logical questions is to make supporting diagrams, graphs, tables etc . For this question, we can draw a rough cube and paint the surfaces as stated by the question. Orange is at the top so it is painted first. Green is opposite purple so it could not be the bottom face, hence we can paint any side face as green and opposite to it must be purple. Yellow needs to be adjacent to both green and orange therefore it is painted as shown. The only choice left for the bottom face is black. Hence black is not adjacent to orange. Geometry is a part of mathematics concerned with questions of the size, shape, and relative position of figures in space. For example, honeybees construct hexagonal (six sided closed figure) cells to hold their honey. In another example, geometry is used in robotic design, planning how to grasp a shape with the robotic arm, or how to move a large frame without collision. It plays a large role in structural engineering, determining which shapes are rigid or flexible, and how they respond to stresses and forces. Symmetry is an important concept of many studies in science. We observe symmetry of molecules in chemistry, systems of laws in physics, etc. Given that the axis passes through the middle point of the sides of the given rectangle, which of the following is true for the given diagram? 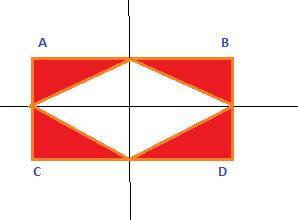 Lines of symmetry should divide the plane into two equal halves so that one can completely overlap the other. In the case of a rectangle, symmetry across diagonals doesn’t exist because when we try to overlap triangle ACD with triangle ABD, then AC will not coincide with AB and CD will not coincide with BD. So a rectangle possesses only vertical and horizontal symmetry. This concept is useful for people designing rectangular objects, fittings etc. Estimates and statisticsis another class of mathematics where an analyst estimates the growth of a company with the statistics of the company like the company’s earnings, profits, sales etc. The analysts estimate or mathematically calculate the future prospects of the company. Estimation statistics are used to make estimates about population values based on sample data. Also, estimation is an important skill because it helps you check the quantitative assertions of others. How do we know that an author or a speaker is trying to mislead you? If you can estimate the value correctly, you will be more aware and have better control over situations. 2. Which of the following skills is sought in a business man or a leader?